Kim Nelson came into the Shark Tank asking for $50k for 25% equity in her cake business valuing the company at $200,000.00. 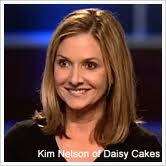 Kim wasted no time in getting her greatest asset (a sample of her Daisy Cakes) into the mouth's of the Sharks. Every single male Shark had the same impression, all followed by, WOW. All the Daisy Cakes use only the best ingredient's from an old secret family recipe that has been passed down from Her Great Aunt, named Daisy. What makes the Daisy Cakes so unique is Nelson's ability to ship the Daisy Cakes in the mail nationwide. In a specially made tin, Kim packs the cakes in dry ice and ships them right to your door. How much does a Daisy Cake Cost? Nelson says a Daisy Cake's cost $44.50 from her website that draws a quick "that's pretty pricey" from Barbara Corcoran. She then asks what it cost to produce a Daisy Cake. Kim responds with $18.50 which Corcoran gives her nod of approval on the profit margin. What makes Kim such a good cake maker is, in her words, "It's my God Given Talent". Good Answer! 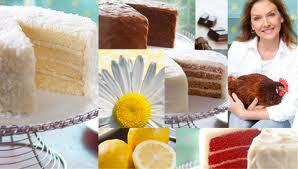 An Entire Line Of Daisy Cakes Delivered To Your Door! Before appearing on the Shark Tank Show, Kim was acquiring the majority of her customer's from attending Holiday Trade Shows and Junior League Fund Raiser's which sold Lot's of Daisy Cake's. Within the last three months (at the time of the taping) Nelson sold over $27.000,00 worth of Daisy Cakes from just three shows. The cake's got the Sharks attention, but most of them think this is a small business play with not much room for future growth. They love the product and devote to becoming customer's, but refuse to give Kim even a counter offer on her business. Barbara Corcoran, the last Shark standing, agrees with the other Sharks and doesn't see this as a super growth company. She does, however, see a very motivated entrepreneur that has all the ingredients of success already in place. It maybe a small investment (in Shark Terms) but one that has potential to make a good return on her investment. Barbara offers Kim the $50k she needs to expand the baking business for 25% of the company BUT she also wants $1 from every cake produced until she gets her investment back. On The Shark Tank Show! I'm not an emotional type of person by any stretch of the imagination but those few seconds when Barbara is laying out the details for Kim is PRICELESS. Kim quickly realizes that her dreams are about to become a reality, and all those years of dedicated hard work are about to pay off in a Big Way. In those few seconds, the cameras managed to capture in Kim's eyes, what the whole "Shark Tank Shows all about" and why it has become such a huge Hit on T.V. Below's an excellent video that was filmed just one month after the Shark Tank first aired the Daisy Cakes and Kim Nelson. The cakes were so popular that it crashed the website for 4 hours before they could take the first order. Kim also mentions that they have already sold over 5000 cakes, at that time, which is already 1/10th of Barbara's initial investment already paid off. They are on track to sell the 50,000 cakes, in which Corcoran gets $1 off the top, way ahead of schedule. Two months after airing on the Shark Tank, ABC did a follow-up with Kim andher mother, Geraldine Adams. The total Daisy Cake sales are already past the 25,000 cake level resulting in Barbara recouping half her investment within just two months. Nelson is also proud of the fact that the entire Daisy Cake operation is 100% domestic. She refuses to buy cake pans from China; instead she prefers pans made in New Jersey. The employee's now baking the Daisy Cakes also has skyrocketed to 240 employees for the area. In June of 2012 Forbes did a Round Table featuring all the Sharks on the Shark Tank Show. They were all asked what has been their best investment, thus far, from the companies they have invested their own money. Barbara claimed that her $50k invested in the "I Love Daisy Cakes" has been her most successful investment. She also says that she got her investment back within three weeks of completing the deal. Obviously this does not fit with the timeline above, so I'm assuming Corcoran is also getting 25% of the profit's while also collecting $1 for every Daisy Cake sold. Either way, She is in pure profit and will continue to be for as long as the Daisy Cakes keeps sending out all those tasty cakes. Kim Nelson, I feel a little silly writing this comment, since I don't know you, but here goes. I saw you appear on Shark Tank and I was impressed by the way you spoke and got my very favorite "shark" Barbara to invest her money!! Kim, you & your grandma's recipes rock!, I own a small business and assist small business with growing issues in their company. Kim you are truly amazing and I asure u that Barbara was a big help and will give you more ideas to help your business. The only thing that caught my eye is that your cakes are kind of pricy. I will buy one as soon as I have free money to spend. One of my friends ordered one and I LOVED it. Keep believeing your dreams. Was so happy tht Barbra saw the potential in Daisy Cakes! !!! It's inspiring. Barbara shouldn't be called a Shark and often gives the passionate that show a heart of gold with a killer instinct the push they need to change lives.